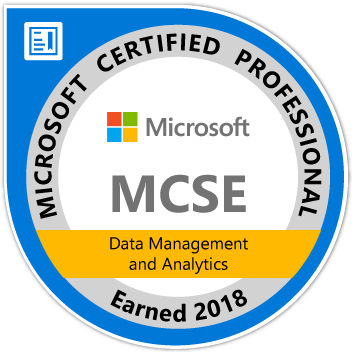 After nearly a two year hiatus, I steered my learning path back towards certifications. I'm happy to tell you I recently passed Exam 70-767: Implementing a Data Warehouse using SQL. If you don't know, there's a non-disclosure agreement for Microsoft exams, so I can't divulge particulars about the exam. But as Cathrine Wilhelmsen (b | t) has done, I wanted to share my experience studying and preparing for the exam.